After having anticipated our summer vacation for months, it had finally arrived! Last year my mom mentioned that she wanted to visit Japan and if we would like to go with her. Of course we said yes. After we agreed to go my brother and godmother decided to come as well. So the trip would be a family vacation. We started our trip with a few days in Hong Kong. It was a nice diversion away from the mainland and we got to have a relaxing time by ourselves before going to Japan. We visited a wetland park, a really neat museum in Central, and had some really nice food. While Hong Kong was nice, we were excited to go to Japan. And everything was going nicely until after we had boarded our flight. Shortly after they had closed the doors, the captain announced that our flight would be delayed because of an earthquake in Osaka. We were a bit shocked and worried since my godmother, Mom, and brother were arriving before us. We weren’t sure if they were effected and couldn’t reach them. After some time our flight was cleared to take off and we were soon on our way to Osaka. When we got there everything was business as usual. Immigration and customs went quickly and efficiently, and then we went looking for the others. Walking to the Starbucks that we agreed as our meeting point I heard a familiar voice. My mom was there! We hugged and chatted before we got down to business of what we needed to do before we could leave for the hotel. First we needed to get money and Jun wanted to get a sim card. Once we were done with that we decided to take a taxi. There, however, were no taxis to be found; we ended up taking a limousine bus. The ride was quick and dropped us at the train station we needed for the train that would take us to where our hotel was located. After figuring out which train line we needed we arrived at Juso and walked to the hotel. Check-in was quick and we were soon in our room! After freshening up for a bit we ended up taking a walk around the place to get a feel of it and to snack on some of the local foods. After awhile we were ready to head back for a good night’s sleep. Our first full day in Osaka started early. Like 3:00 in the morning early. My mom was having a difficult time adjusting to the time difference and got bored. She ended up waking us all early. As a result we decided to have an early start in exploring Osaka. We first went to Osaka Station to get ICOCA cards for local transportation and to get some breakfast. Once we had finished all of that we decided to visit Osaka Castle. We took the JR Loop train to get to the park. It was easy to navigate from the station to the castle. The surrounding park was quite nice and it was a nice stroll going through the park to get to the castle. At the castle we found out that the elevators were not in operation due to the earthquake and were being checked. We would need to go up to the top using the stairs. Fortunately each floor had different displays about the city and the castle so we could rest a bit before continuing to go up. When we did get to the top we were rewarded with really nice views of the city, and the breeze up there was nice as well. After the castle we continued to go around the park, but we soon decided to look for a place for lunch. After consulting with different apps we settled on an udon place nearby. The food was delicious and it was fun trying to figure out how to order at the noodle shop. But we persisted and we were rewarded with a nice lunch. After lunch we then went to Shitennōji Temple. When we got there it started to rain, so we had a quick visit around the temple. It was a really nice temple. We were amazed at the number of turtles in the water features at the temple. But because of the rain we didn’t stay long here. With it raining we decided to do some shopping in Umeda and see what there was to see. Apparently there was a lot to see! At that time we decided it was getting late and we went back to the hotel and relaxed before going to sleep. Another rainy day and we decided that it would be best to try to do things inside. The first place we went was to visit Kaiyukan aquarium. It was a great experience. There was such a diverse range of marine life that you could see from all over the world. The central tank was awesome and you could view it from different angles as the aquarium went around it. And there were penguins! It was neat to see the emperor penguins. We even got to see some of the nesting pairs. It was a nice way to spend the morning. After leaving the aquarium we went in search of a place for lunch. We ended up having sushi at a nice restaurant close to the aquarium. Then we also had some matcha desserts as well. As it was still raining we decided to go to Shinsaibashi and Dōtonbori. These are shopping areas in Osaka. They are also covered shopping arcades and we could do some shopping and explore the area without getting wet. We then went back to Osaka Station for dinner at a small restaurant that served beef in bento boxes. It was again a nice dinner. On this day we started using our JR Rail Pass to visit different parts of the surrounding area. We decided our first trip would be to go to Kyoto. When we got there we quickly boarded another train to visit Fushimi Inari-taisha. This temple complex is dedicated to Inari, the Japanese fox goddess. It’s an amazing place and is full of red torii (gates) that go around the temple complex. With the recent rains the air around the grounds was crisp and left a mythical feel to it. It was a joy to walk around the temple. From there we walked down a side street with a number of street vendors selling all kinds of Japanese delicacies. We ended up having lunch trying different types of food. Then we went to visit the Imperial Palace in Kyoto and got to explore around the grounds. It was a stark contrast to the modern architecture of the palace in Tokyo. The gardens at the palace were particularly beautiful. From there we then went to Arashiyama so we could see the bamboo forest and Tenryū-ji. It was a beautiful area and the gardens were gorgeous. We then did some shopping at the small stores in the area. I also got to have sakura-flavored ice cream that I had been craving for since the last time I was in Japan. It was so good too! The last thing we did there was to see the monkeys at Iwatayama Monkey Park. As it was a bit of climb to see them, Michael, Jun, and I were the only ones who went up. It was neat to see the monkeys walking around freely. Afterwards we went back to the train station and went back to Osaka for the night. 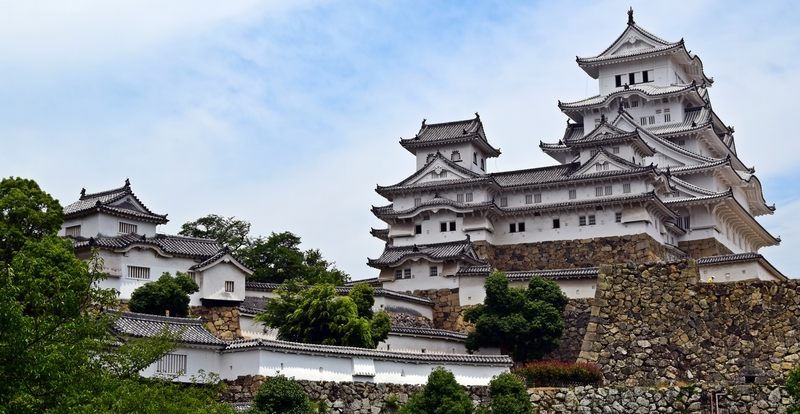 On this day we took the train to Himeji to see the amazing castle there. It was quite easy to find the place as it dominated the skyline. The castle was amazing and it was fun to walk around. There weren’t too many people there so it was nice to just enjoy exploring the castle. We were also able to visit a garden nearby. It was nice, but nothing too special in terms of flowers or layout. Afterwards we went to this really nice udon restaurant where we could see them make the noodles that we were eating. It was so delicious. We all left happy. From Himeji we next went to Kobe for a few hours to explore the old European enclave near Shin-Kobe station. It was interesting to see the European buildings in Japan. There were a number of snack places that I think most of us enjoyed more than the buildings. There was one place that sold chocolate brownies that were really delicious. As it was getting late in the day we decided to take the Shinkansen back to Osaka and find a place to eat dinner there. We ended up at a weird place where everyone had to order something; anything was fine but you had to order at least one thing. It was strange. The rain came back, but we didn’t let it stop us. This day had us go to Nara. Nara was really neat and we got to see deer roaming Nara Park in the rain. That was the highlight of this day. When we got to Nara it really started to rain and we ended up taking shelter in a covered arcade where we wandered through different stores and had lunch at a really nice curry place. While we had hoped the rain would abate, it didn’t and we decided to just go and explore the park in the rain anyway. It ended up being fun. As we walked around the park we got to see deer just walking around chasing people who dared to buy food to give them. We also went through some temples that were made ethereal in the rain. As we were walking back to the train station we did some shopping and found an amazing ice cream place that had some great matcha and French vanilla soft serve in really tasty cones. It ended up being a nice way to end up our time in Nara. On the way back to Osaka the others decided that they wanted to go to Tokyo just to say they had been there. So when we got to Osaka station we booked tickets on the Shinkansen to go to Tokyo the next day. Once that was settled we went back to Juso to have sushi for dinner and go to bed. We got up early and headed to Shin-Osaka station for the train to Tokyo. Once we settled in we enjoyed the quiet journey to Tokyo by mostly taking a nap. When we got to Tokyo we first went to find a pharmacy for Mom who needed some cough medicine as the rain from the previous day and the lack to sleep finally caught up to her. We quickly found a pharmacy and Mom was able to take the medicine she needed. Afterwards we walked to the grounds around the Imperial Palace to see it. Then we walked to Ginza so they could see the shopping district. We ended up having Chinese food at a decent restaurant in the area. We walked around Ginza and did some shopping. From Ginza we took a train to see Meiji Temple. We ended up taking the long route to the temple, but it was a nice walk through a residential area of Tokyo so it wasn’t all bad. And then we walked into Yoyogi Park that was more like a forest. It was interesting to leave the city behind and to visit the park and the temple. It was a bit busy, but not too bad that it was not enjoyable. Aftewards we went back to Tokyo station to get ready to go back to Osaka. We first went and found some food to eat on the train ride back. And we also got to see a Kit-Kat boutique. That was neat. Kit-Kat’s come in different flavors in Japan and are a common gift to give students as the name sounds like a Japanese phrase wishing good fortune. While we didn’t buy any here, Jun and I did buy some matcha and banana Kit-Kats at the airport on our way back. Both were quite good and I would like to try other flavors as well. Once we borded the train ride back to Tokyo we ate our dinners and just relaxed. I did end up sitting next to an interesting gentleman who could not sit still and every ten minutes would go wander around the train before coming back. He did, however, have an interesting book of Donald Trump and Kim Jong-un on the cover in strange poses. If only I knew Japanese! Our last day in Osaka and we decided to take it easy and explore some of the older parts of the city. We first went to Tsūtenkaku and walked around the area. That was a neat little area. And then we went to explore the area around Hōzenji Temple. That was also interesting. There was a Fudo Myo-o statue covered in moss because people over the years had thrown water on it to purify themselves. All the water pouring eventually led to moss growing on the statue. Because we had seen a lot in our week here, we really weren’t interested in seeing different sites and ended up spending the afternoon doing some shopping. Jun ended up buying a really cute Pikachu! And then we ended the day with our last dinner together by having a nice sushi dinner. Mom, Michael, and Gaye had to leave early so they could catch their flight. So Jun and I said goodbye to them and wished them a safe journey. Jun and I got a few more hours of sleep before we went ourselves to the airport. We took the train one last time and had quite an easy experience checking in and going through immigration. We ate lunch and then boarded our flight back to Hong Kong. It was much more relaxing and easy than our trip to Japan. From the airport in Hong Kong we then made our way back to Shenzhen. Overall, it was a great trip. I was really happy that I was able to see my mom, brother, and godmother. It was like the trips we took when we were kids!